WMT TELEVISION CBS for Eastern Iowa PARAMOUNT THEATRE BLDG., CEDAR RAPIDS. IOWA 52406 EMpire 4-0171 Ju;y 11. 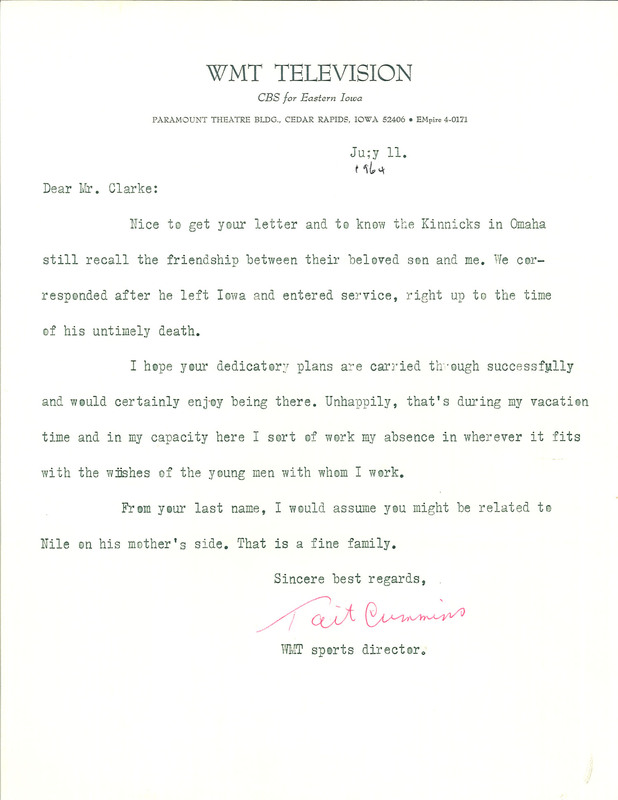 1964 Dear Mr. Clarke: Nice to get your letter and to know the Kinnicks in Omaha still recall the friendship between their beloved son and me. We corresponded after he left Iowa and entered service, right up to the time of his untimely death. I hope your dedicatory plans are carried through successfully and would certainly enjoy being there. Unhappily, that's during my vacation time and in my capacity here I sort of work my absence in wherever it fits with the wiishes of the young men with whom I work. From your last name, I would assume you might be related to Nile on his mother's side. That is a fine family. Sincere best regards, Tait Cummins WMT sports director.